I’m so excited to dive right into this third installment of my “Inspired by comic books” series. Today, I’ll be talking a bit about Marvel Comics. (If you missed part one and part two, please check them out). In the first two installments of this series, I included images from the My Geekdom board I created on Pinterest, so I think I’ll just continue with that. I’ll also continue to include posts from My Geekdom, a blog series I wrote, over at The ToiBox of Words. 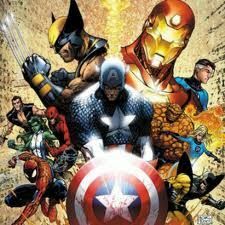 For your convenience, you can check out the post, My Geekdom 04: Marvel Comic Books right here. For this installment of the series I’ll, obviously be focusing on how Marvel Comics have influenced me and my writing in general terms. But first, here's a very brief history of Marvel Comics. Marvel is just as old as D.C comics starting near the same time, but it didn’t hit its high point until the 1960s, which is often referred to as the Silver Age of Comics in the US. I can’t remember the original name of the company, but I know it was once called Atlas Comics. It didn’t become Marvel Comics until the Fantastic Four series took off. At the beginning of Marvel’s heyday, many criticized the company for creating knock-offs of D.C. characters (which they did do back then). The company eventually made a name for itself with the talent of Stan Lee and the perfection of the “flawed hero”. For me, Marvel Comics represents the scariest part of possibility- “fear of the unknown or possible.” Aside from the fact that many Marvel Comic stories take place in the real world, the overall theme of the flawed hero adds a sense of realism or humanity to this comic book universe. There was once a time when all super heroes were near perfect. They were boy scouts and girl scouts, who were perfectly well-adjusted, with little to no vices; and most of all, they were all happy and willing to be heroes. Marvel put an end to all that, and in time, other comic book companies followed suit. It used to be that freak accidents only created super villains, but in the Marvel Universe, there’s a thin line between what makes a hero or a villain, and freak accidents can and will happen to anyone. This is an idea I like to explore in my own writing. Not all my villains are evil for no reason, though some are; and not all my heroes are perfect angels, even when they happen to be part-angel. While the comic book industry has always been ahead in the game of diversity, it was the Marvel Comics that really stood out to me as embracing the differences in character’s culture, skin color, social economic status, and more. Marvel Comics gave us the X-Men (mutated humans often hated by other humans even when you can’t look at them to tell they are different). One of my favorite superheroes, and one of the most powerful created, is Storm (from the X-Men), an African woman with the ability to control all weather. Marvel also gave us Peter Parker aka Spiderman (a nerd by social standards who fights crime under a secret identity). One of these heroes was born this way and the other had a freak accident. They both have personal issues, yet they are both heroes, often times fighting to save people who hate them. I hope to someday write something as powerful and impactful as that. Toi shares part three of her series on inspiration and comic books. Marvel, Spiderman, X-Men, Storm, how can you go wrong??? I haven't really followed comics since the tragic demise of two thirds of my collection, but this is fascinating. And I do enjoy X-Men, in part because of Storm! Thank you, comics are a source of inspiration for many artists and writers I know. So sorry you lost so much of your collection. I can't even imagine that. Toi Thomas shares how Marvel comic books inspires her writing on Our Author Gang. Today on A Small Gang of Authors, Toinette Thomas​ continues her discussion on how comic books, and especially Marvel Comics, inspire her writing. This is great, Toi! I'm of the age where I was already comic books when the first Marvel comics hit the stands. Marvel stole me away from DC Comics, lol! I've gotten a little inspiration from comic books, too. Looking forward to your next installment. +Toi Thomas -- I don't remember Prince Targo, mentioned in this article, but it might have been before my time. Dax appeared occasionally in Eerie -- not in every issue. I found the issue picture in this article several years ago on eBay. Cool. I'll check this out. Today, I focus on the influences Marvel Comics has made to my writing. Check it out. I can understand that. I think comic books is one of those artforms that's hard to get into as an adult; it's not impossible but having that childhood experience really helps. Loved learning the history behind the scenes!!! I think people in the book industry have much to learn about the comic book industry and vice versa. They are both incredible storytelling mediums and can learn a lot from each other. I am a little late coming into the comic book world, and I still don't read them. I have to ask my daughter to fill me in on all the history, which she will gladly do for hours on end. All that being said I do enjoy the Marvel characters a little more than the DC characters. I love how you can use the example of the comic books to inspire your work. In recent years, writers have taken on the task of novelizing many of the more popular comic stories to give these incredible characters and worlds a whole new audience. There's a series out now that has already novelized Batman and Wonder Woman, with many more on the way. Even indie comic writers are starting to do this. Sadly Marvel Comics are not that big in the UK. I haven't read one since I was a child, but I did enjoy them. From what you said I think I might enjoy them now. That's interesting. I can think of a few UK characters from the Marvel Universe such as Captain Britain and his sister Psylocke, but I haven't personally read a lot of their stories. I think the main reason why Marvel sometimes has trouble in foreign markets is the fact that one of its major heros is literally called, Captain America. If there are any tensions between the US and any other country, stories involving that character are likely to suffer. Classic Marvel comics are great, but recently they have changed so many of their characters that I don't recognize any of them. Frankly they should've found a different direction to go in, one that didn't alienate long-time readers. I have to agree with Toi on this one. If there is anything that comics are famous for its changing their story lines. The Marvel universe is famous for this. Wolverine has so many tangents and story arcs its hard to keep them straight. Its why no one ever questioned the plausibility of the movies when they just relaunched one set while the other set was still going. Plus, when it comes to the movie, many of the film goers are seeing these stories and characters for the first time, so they don't know what's original or not. They are just seeing what they are seeing.